Matt Willing follows Div I winner, Eric Thompson, and leads eventual Div II winner, Ryan Leech. Paul Webb runs up the "wall" of mud. After the collegiate race, Kyle headed back to Virginia and Matt and Paul got prepared to race again later in the day. First Matt competed in the UCI Elite race against some of the country’s top talent, including two riders who represented the USA at last year’s World Championships. By the afternoon start, the rain had been steadily falling for a few hours and the course had turned to slippery mud. Matt started on the back row of a large field and worked his way up to a solid 19th by the end. In the final event of the day, the men’s category 2/3 event, Paul Webb started strong and finished strong, riding in third place from the first lap until the end. 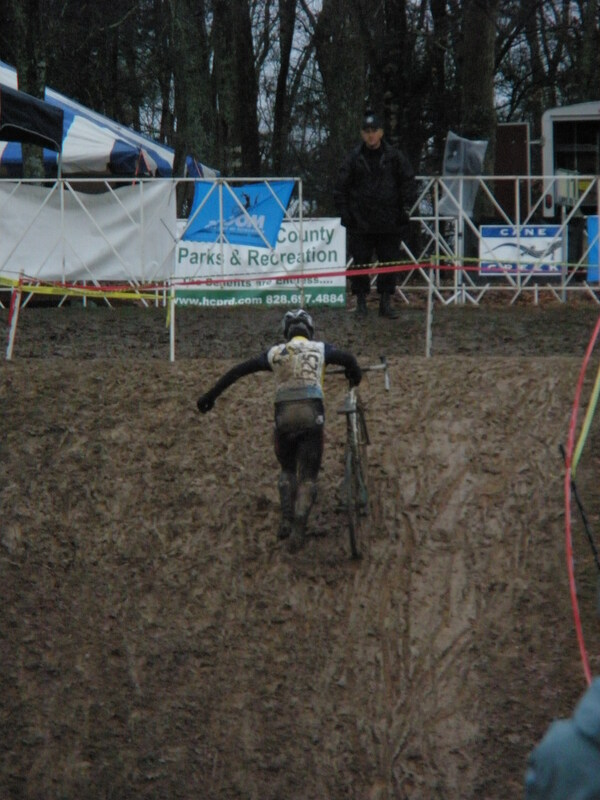 The course by this time was totally destroyed by the rain and two full days of racing, but watching the racers negotiate the slick mud did make for a fun spectating event. 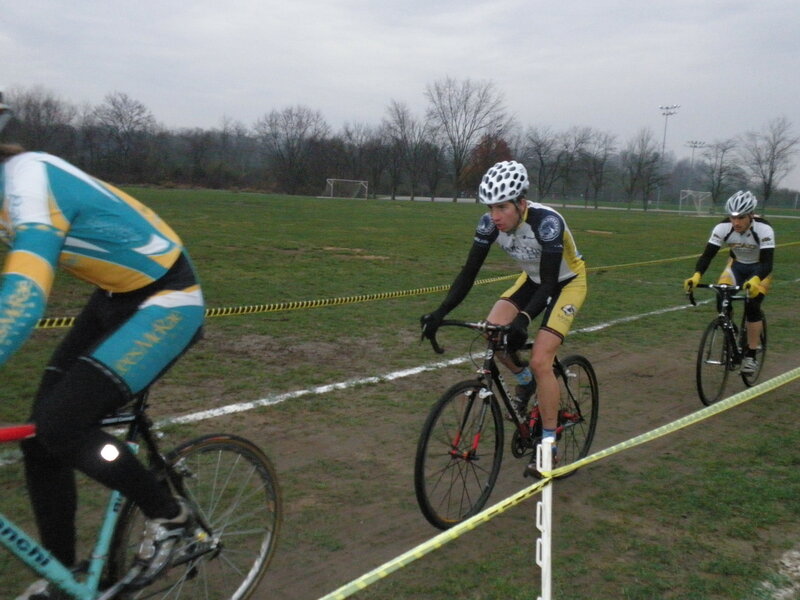 Cyclocross Team Claims 4 Podiums Over the Weekend! It was a banner weekend for the MHC cyclocross team, namely Matt Willing and Paul Webb, as they claimed 4 podium results at the team’s first collegiate cyclocross events of the year. On Saturday, both Matt and Paul competed in the collegiate A category at the Mud, Sweat, and Gears event in Johnson City, TN. Paul followed up his strong win last weekend in Salisbury with a repeat victory and winning the only SECCC cyclocross event of the season before conference championships. Matt followed closely behind in 2nd place. Paul also rode to a very strong 5th place finish in the Pro/1/2 event, his first attempt at that level after recently receiving a category upgrade. On Sunday, Matt and Paul competed in an Atlantic Coast Conference event put on by Appalachian State in Boone, NC. Matt was in contention for 1st with Lees-McRae standout Brad Perley, but a slight bobble through the barricades lost Matt some ground and he couldn’t come back on Perley before the finish. Paul finished next in 3rd place. Four podium finishes in two races is a great sign for the team as we head into this weekend’s Southeastern Collegiate Cyclocross Championships in Hendersonville on Sunday at an early 8am. Joining Matt and Paul will be new MHC recruit Kyle Knott, who excels on and off the road. The team should have plenty of opportunities and matches to burn as they seek out MHC’s first conference championship. A full day of racing is planned, and the team will compete in the elite men’s race later in the afternoon. Paul Webb, after a strong mountain bike season, has found his rhythm on the cyclocross bike recently, and stormed to an impressive win at the North Carolina Cyclocross event held in Salisbury last Weekend. Paul got a clean start and took over the lead near the end of the second lap and never looked back. Paul continued to negotiate the fast course to finish about a minute over second place. This weekend, Paul and teammate Matt Willing, will travel up to Johnson City, TN, to take part in the Mud, Sweat, and Gears #4. 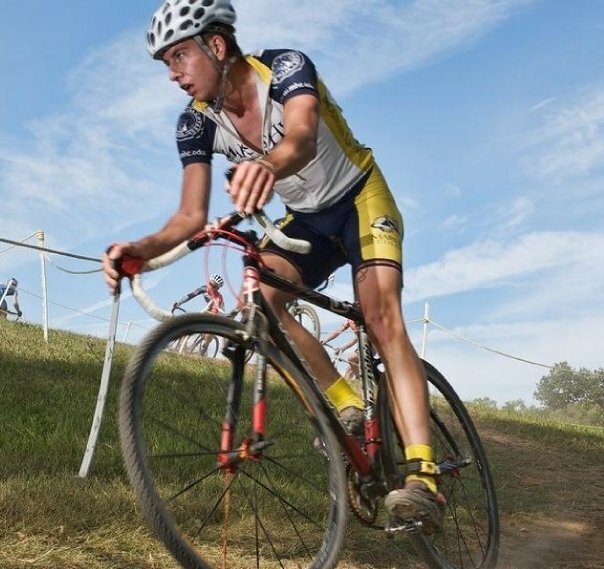 This will be part of their preparation for the next weekend’s series of races in Hendersonville: two UCI PRO events, plus the Southeastern Collegiate Cyclocross Championships. The men’s collegiate championship event will start at 8am on Sunday, the 22nd; so show up early to watch the battle, for the winners will likely be on the podium at the at the National Collegiate Cyclocross Championships held on December 13th in Bend, Oregon. Last year when MHC Cycling was just getting off the ground and struggling to raise money to get the team to the races, Asheville Bicycle Racing Club (ABRC) and its president, Marios Georgiou, reached out to the team to lend a helping hand, and a rather large and timely check too. This year, we’re happy to report that ABRC and its board of directors have agreed to increase their support for 2010. Both Matt Willing and Paul Webb from Mars Hill College have joined the ABRC team and will fly the ABRC colors at cyclocross events this winter at all non-collegiate events. We are proud to represent this non-profit organization that has been promoting amateur bicycle racing in Western North Carolina since 1984. They really are the backbone of our local cycling scene, offering mentoring and coaching for newer riders as well as opportunities to advance to the elite levels in all disciplines: road, mountain, cyclocross, and track. They host a number of weekly training rides, including the seasonal “Tuesday Night World Championships” and the year-round Saturday Morning Bakery Ride. They have sent members to national and international competitions, and every year they put on one of the region’s most competitive races, The French Broad Cycling Classic. Visit their website at abrc.net and their popular bulletin board for more info about rides, races, and other cycling related events. Become a member of WNC’s most organized racing club. Contact Marios at gemarios@charter.net for more detailed information. Matt Willing popped an impressive podium result yesterday in Pro/1/2 event in Boone, NC, part of North Carolina Cyclocross Series. After a shaky start that found him about 20 riders back, Matt powered through the mud, fog, and a strong field to take a solid 2nd place behind Eric Thompson, a 3rd place finisher at last year’s Div I Collegiate National Cyclocross Championships. This all bodes well for Matt and Mars Hill as we enter the final six weeks before this year’s Div II nationals in Bend, OR, on December 12th. While this is Matt’s first podium in a pro event this year, he’s no stranger to the podium, having won six of nine events last year in the B category in Michigan’s cyclocross series. The first event of that series was Matt’s first bike race ever. This year Matt has made the jump up to the top ranks and will race for the Asheville Bicycle Racing Club in all non-collegiate events. Matt has demonstrated that he belongs with the pros by riding to a couple of top ten finishes in Michigan’s UCI Pro event earlier this year, as well as competing strongly against the very best in the nation at last week’s USGP UCI event in Kentucky. Matt will take a break from racing next week for some secret training leading into November 14th’s first collegiate event of the year, hosted by King College in Tennessee, followed by the Southeastern Conference Cyclocross Championships hosted by Brevard College and then Hendersonville’s UCI pro events on the 21st and 22nd. The Raw Revolution Has Arrived! The first shipment of Raw Revolution organic live food bars arrived at MHC Cycling’s headquarters this week. Inside the package were boxes containing eight different flavors! We are so excited to have the support of a company who understands what cyclists really need to perform at their highest levels: raw and organic foods in a combination that is easy to eat and digest while riding a bike at 25mph. I’ve had trouble digesting and feeling bloated with other bars that are cooked, but these go down easy and seem to more readily convert to pedaling power. Plus, there’s plenty of protein from a variety of sources without having to resort to processed soy isolates, which seems to be the defacto source of protein for other bar manufacturers. And no need to panic… they’re certified organic. The team has been hungrily sampling each flavor and so far the Cashew and Agave Nectar, Raisin and Chocolate, and Coconut and Agave Nectar have all received excellent feedback. My one-year-old son has really taken a liking to the Spirulina and Cashew bar, devouring one in minutes, and he keeps bringing me more to open. And he cries if I don’t! So far none on the team have resorted to crying for more, but then we haven’t run out yet. We are proud to represent a company that’s doing what’s best for both personal health and the global ecology. Check out Raw Revolution’s full line of products and flavors at www.rawindulgence.com.